Professor Chossudovsky’s latest book describes America’s hegemonic project in the post 9/11 whereby the U.S.-NATO military machine —coupled with covert intelligence operations, economic sanctions and the thrust of “regime change”— is deployed in all major regions of the world. The threat of pre-emptive nuclear war is also used to black-mail countries into submission. There is an intimate relationship between the Globalization of War and the Economic Crisis. This “Long War against Humanity” is carried out at the height of the most serious economic crisis in modern history. It is intimately related to a process of global financial restructuring, which has resulted in the collapse of national economies and the impoverishment of large sectors of the World population. Michel Chossudovsky views “economic conquest” as an integral part of the US military agenda. The US military and intelligence apparatus consults with Wall Street and the Texas oil conglomerates. Conversely the IMF and the World Bank are in permanent liaison with the Pentagon and the US State Department. The contribution of Global Research Members enable us to make CRG articles and videos available to the broadest possible readership. Becoming a member essentially constitutes an endorsement of the Global Research website. 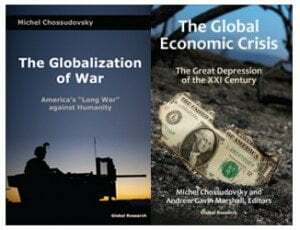 New Global Research members (annual) will receive a copy of The Globalization of War together with “The Global Economic Crisis, The Great Depression of the 21st Century. Both titles will be sent to all those who renew their membership (annual). The Global Economic Crisis addresses the issue of oil prices, financial manipulation and economic warfare. All new members (annual basis) as well as all membership renewal (annual basis) will receive a FREE copy of “The Global Economic Crisis: The Great Depression of the XXI Century“, as well as a FREE copy of Michel Chossudovsky’s latest book, “The Globalization of War: America’s “Long War” against Humanity“. The complex causes as well as the devastating consequences of the economic crisis are carefully scrutinized with contributions from Ellen Brown, Tom Burghardt, Michel Chossudovsky, Michael Hudson, Tanya Cariina Hsu, James Petras, Peter Phillips, Peter Dale Scott, Claudia Van Werlhof and Mike Whitney.